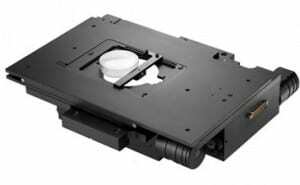 XY Microscope Stages for Inverted Microscopes – H117 | EINST Technology Pte Ltd.
An extensive range of motorized XY stages to fit the majority of inverted microscopes available. The H117 stage series has a completely flat top for easy access, and includes Intelligent Scanning Technology (IST). In conjunction with extensive testing, IST allows each stage to be pre-programmed with a unique set of operating characteristics particular to that stage to ensure optimum performance. IST allows the ProScan™III controller to make any required adjustments to maintain superior orthogonality and metric accuracy. 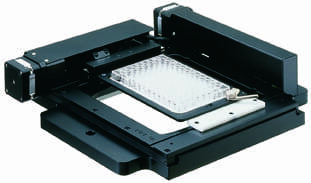 Click here for datasheets about stages for Nikon TE2000 microscopes, here for Nikon Ti microscopes,here for Olympus microscopes, here for Zeiss microscopes and here for Lecia microscopes. They have been used for cancer research in a system for obtaining extremely high quality images. Flat top for easy access.